"Celebrations / Secret Santa and Chookies Secret Santa"
"Celebrations Swap" and our last swap occasion was Christmas. On Christmas morning I got to open my final pressie from Claire. 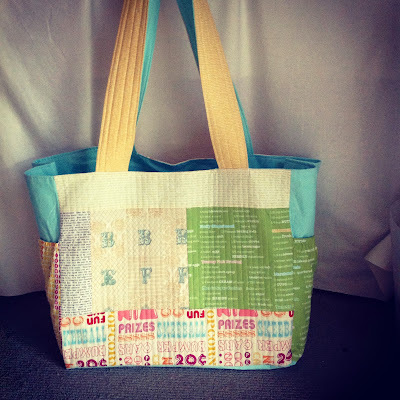 My new Beach Bag. Perfect in Text Prints. It fits Lily and there is still room for Beach Towels. Here is what I sent to Claire. 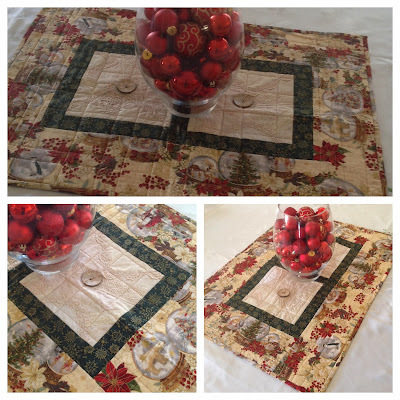 I made two items, one to open when she decorated her home for Christmas. Which was this Table Topper. A Gail Pan Design. Then another gift to go under her tree to be opened Christmas Day. 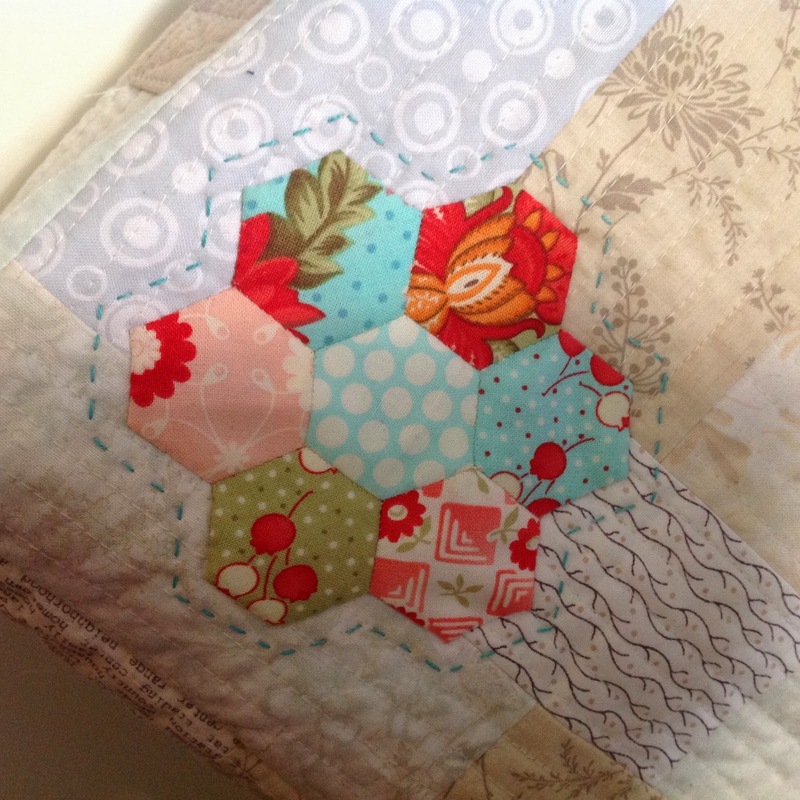 Claire is also a fan of Bonnie and Camille Fabrics so I decided to go low volume and then add a hexagon flower of each Bonnie and Camille Fabric from Bliss onwards and randomly placed them with the thought that Claire might add a new flower for each new range that comes out. I know that she has a stash of "April Showers" so I wonder how long it will take her to add that hexagon flower? 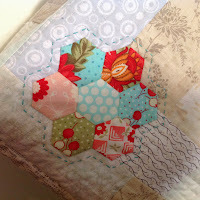 I also added a little hand quilting around each flower. 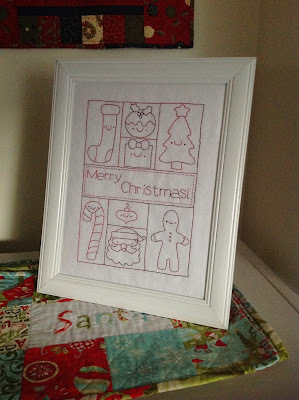 where my Santa was the talented Roslyn (no Blog). My dinning table for Christmas day got quickly rearranged and this table topper was placed center stage. Thank you Roslyn, it is perfect. 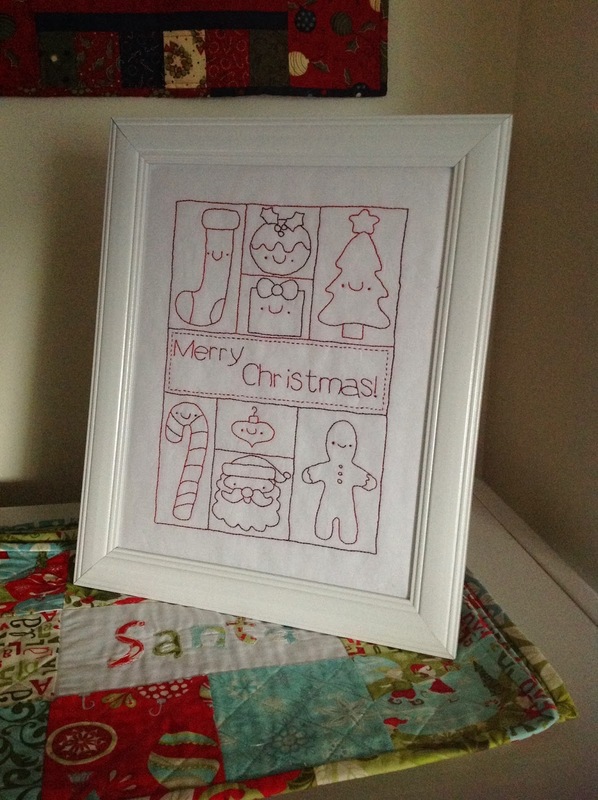 My new Christmas Redwork Stichery made by the lovely Michell. I also received this gorgeous decoration that has been on my tree all month. Thank you so much Michell. Huge thank you to all my Swap Partners. What beautiful gifts. Handmade pieces of someone's heart. All beautiful gifts!!! Enjoy your weekend!! Beautiful presents coming in and going out!! Awesome gifties both sent and received! Lots of lovely goodies both sent and received! Love the flowers on the cover. Everything is just gorgeous Sharon, both the presents you received and sent. All so lovely Sharon. Really like your idea with the hexies and low volume prints. 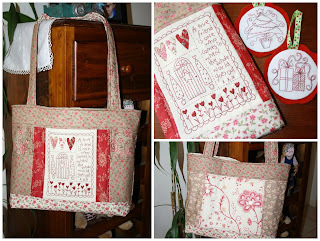 Ah, you can't go wrong with Bonnie and Camille :) Gorgeous goodies all round Sharon. I can see you had a fabulous Christmas !!! Lovely gifts, both sent and received.